We have had such a fab week welcoming back some of our long lost Little Forest Folkers after a lovely Summer. We all sounded like a lot of old family friends with our exclamations of 'Oooh, haven't you grown?!' as they came in through the gate. In such a short space of time it is amazing to see how the children have banded together to play great big group games from their initial side by side playing. The children at Paradise love the age old classic game of 'Hide and Seek', and with the flower beds still tall and green with produce they were eager to suggest we commenced play right away. With only a little adult input the children were quick to remember the structure of the game and set about organising one another, 'I'll count and you hide!'. It was brilliant to hear children, after a little support, start trying to count to ten independently. Some using their fingers for support, some remembering all the numbers in order. And some forgetting what number they were trying to get to because they simply must find those pesky kids! Whilst all the counting was going on, the others were eager to group together to work as a team to find the best places to hide. Initially this was right in front of the child counting, but with their hands covering their eyes. However, after a little practise, and mathematical vocabulary development from the adults such as, 'Crouch down, crouch DOWN!!' and 'Behind! Hide BEHIND, the beans!' by the end they were really getting the hang of not being seen and were finding terrific hiding spots on their own! Over at our Windmill site the children have been immersing themselves in their own imaginary worlds. One of our long running worlds is the secret land of Peter Rabbit. After setting up a sign for Peter Rabbit's home last week and leaving him a letter down his hole, imagine our surprise when the children called in for a cuppa with Peter this week and discovered that he had left us a letter! It was such an exciting discovery for all of us, especially considering none of us adults had any knowledge of writing a reply! The forest really is a magical place to play and explore. Unfortunately a few children did fall down the hole and had to call to their friends for help. 'Are you ok, Spiderman?! I'll help you!' Sticks and ropes to the rescue as the 'stuck' children were hoisted out from the muddy hole. Meanwhile the car logs became a bus, with the addition of an extra log which required the assistance of all the children to carry over. Our driving adventure took us all over the place this week. After a quick trip to the supermarket for apples and cheese (these kids love an elaborate cheeseboard), they then decided they needed a spot of exercise down at the swimming pool. Popping their ‘goggles' on (sticks held in front of their eyes!) the children jumped in and splashed around before taking it in turns to slide down the muddy hill and into the 'pool'. Shouting for their towels, the children clambered out and we had our well earned snack. Not only is it wonderful to be invited into these explorations of the mind, it's great to see the children taking on roles and developing lovely narratives based on their experiences. 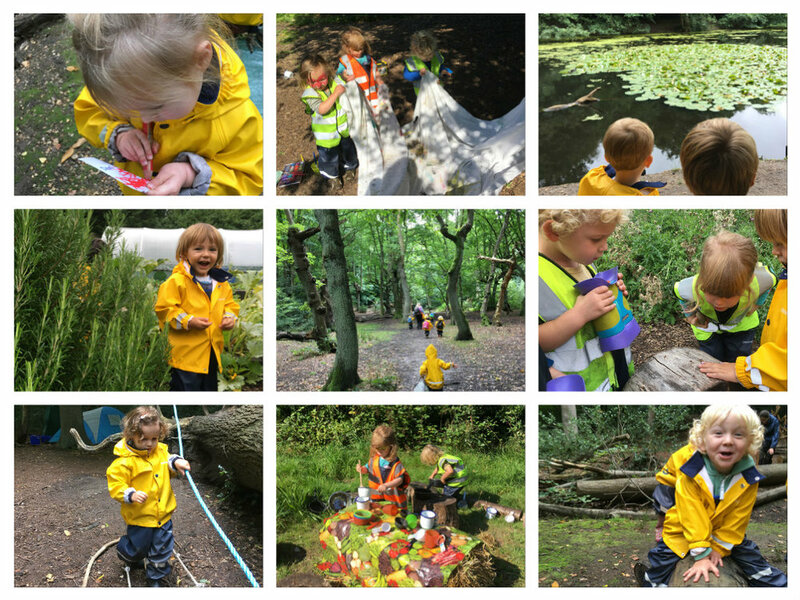 Whatever we are playing it's always guaranteed to be an exciting day in the forest and we would like to thank all our children for another cracking week of fun. Hope you all have a super duper weekend. Don't forget it's the Wimbledon and Putney Common Open Day on Sunday 10th September if your children want to see the tractors and horses up close!